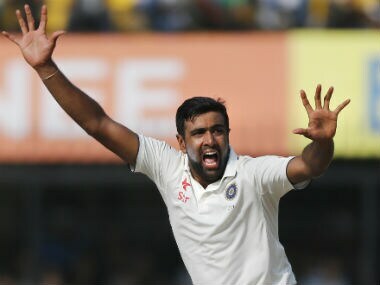 Chennai: India's premier strike bowler Ravichandran Ashwin does not want to put extra pressure on himself thinking about the coveted milestone of reaching 300 Test wickets in remaining 10 home matches this season as these aspects can rob a player's enjoyment derived from his game. "As of now, I am not looking at any numbers or chasing any targets. I am just enjoying the space I am in. When you are really doing well, you don't think about how well you are doing as that can lead to losing out on enjoyment from the game. So, at the moment I am not really looking too far ahead," Ashwin told reporters at a promotional event on Monday. With 220 wickets, highest by any bowler in his first 39 games, Ashwin admitted that he is going through a nice phase in his career currently. "From last year or so, I have said that I have been bowling well. It is pretty clear from the way it is coming out of my hand. My rhythm and my action are falling in place," he said. "Of course, I have been deeply thinking about my game. I am trying to grasp as to what has gone right and what went wrong. But what I have understood is that rhythm is very important. Sometimes, it is difficult getting into the rhythm and it takes some time. Throughout this series against New Zealand, I was settling into a nice rhythm as I bowled more," he explained. Asked about his 'bunnies', Kumar Sangakkara, AB de Villiers and Kane Williamson, who have found him menacing in the sub-continental conditions, Ashwin replied: "Honestly, I am really lucky to put aside these names (above mentioned). To have got better of them in games that I have played so far is pleasing to me. I am going to come up against lot of good players in the coming few months. It could be very interesting and I hope that I start off on a good note." On the upcoming England series, the 30-year-old stated: "England is a very good side. It is not going to be easy to put it past them. I will do my homework and try ensuring that I stick to good lines and lengths and get my rhythm going. That is going to be the most important thing." On a parting note, Ashwin said that the break in the ongoing ODI series was a much needed one for him to get refreshed before the big-ticket series. "I think I needed this break more than anybody else. I wanted this break and I needed to be really fresh," he signed off.